Some time ago, my daughter and I discovered the back road route from our North-East San Antonio home, to Boerne; basically, going up 281 to Route 46 and then west to Boerne. This last weekend, we went a step farther, by going north up Bulverde Road and bypassing the horrendous 1604-281 nexus entirely. Really, as they get closer and closer to completing the interchange, traffic just gets worse and worse. And once we got to Boerne, we decided to take Ranch Road 1376, or the Sisterdale Road north to the Pedernales Valley – this turned out to be a fantastic way to get to Fredericksburg; scenic, little traffic and just about as rapidly as by the highway ... except for being tempted to stop at so many interesting places – even if it were only to take some pictures. 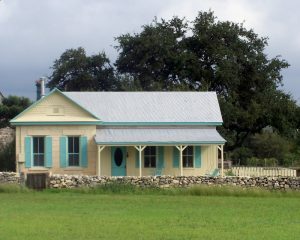 The first of these temptations was just outside old Bulverde, proper; a charming Victorian cottage painted in bright yellow with aqua-blue trim and shutters, with a low stone wall in front, and some old stone buildings behind. It's actually the remains of the old Pieper homestead. Behind the cottage is a the original stone farmhouse, which has barely held on to it's original shake roof, and the stone barn beyond it, which has not. The current owners are in the midst of restoring the Pieper house, which when first built was the largest stone house around. The house and barn, and the backyard – shaded by an immense oak tree – is currently being used as an event venue and the pretty cottage is a bed and breakfast. We pulled in to take some more pictures – and wound up getting a tour of the whole place. I only wish that I had enough money from my books to buy a place like it; it's spectacular in a low-key kind of way. On to Boerne – with a pit-stop at the Squirrel's Nest for my daughter's weekly thrift-shop fix – and into the Hill Country by way of Sisterdale. 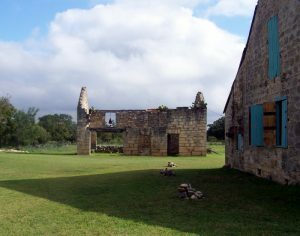 Sisterdale was one of the original German settlements founded by the Adelsverein pioneers – one of whom was the Baron Westphal, Karl Marx's brother-in law. 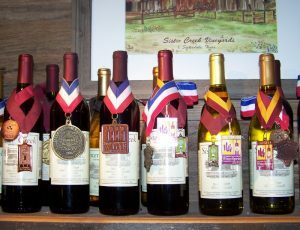 Today Sisterdale is a little string of a hamlet spread out for several blocks along the road, and distinguished by Sister Creek Vinyards, housed in an old cotton gin building, and the Sisterdale Dance Hall and event center. My daughter was more interested in the swap meet going on next to the Sisterdale Market ... and I was interested in the market because it was housed in one of those old 1920's era peak-roofed cottages, with bead-board paneling throughout – and it actually seemed to be a very complete and efficient little one-stop grocery. 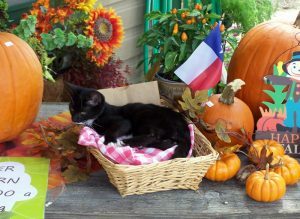 So – discouraged my daughter from making a bid for either of their two shop cats – and on up the road. 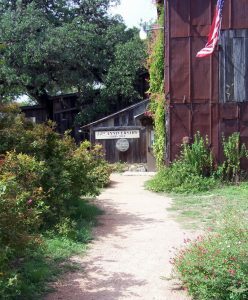 Luckenbach is the next hamlet of any distinction, mostly because of Willie and Waylon and the boys. Besides the dance hall and concert venue – another destination in itself, the Armadillo Farm campground sprawls alongside the road. It seemed pretty crowded this last Saturday, although since it was a long weekend, I should not have been surprised. 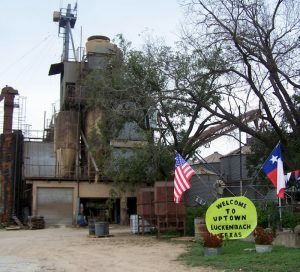 We were tempted to stop in at Uptown Luckenbach, mostly so I could take a picture of the towering old factory building – mostly gone to rust, but still spectacular. 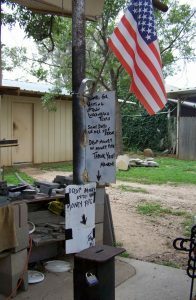 There was also a souvenir shop on the grounds, but a hand-painted sign noted that sometimes it was a self-help arrangement. That afternoon was one of those times. 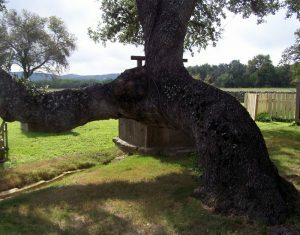 We did eventually get to Fredericksburg – but that is another story.